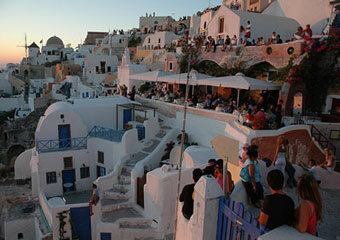 There are a lot of things that are unforgettable about Santorini. It is the kind of island that sticks with you for a while after you leave. 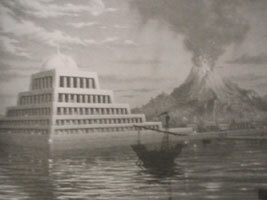 Who could forget an island that legend holds is in fact the lost island of Atlantis? Or an island that is informally known as "the Devil's island", because the inhabitants are supposedly experts in dealing with the undead vampires? Honestly, who could forget that? But do you know what Santorini reminds me the most? My wedding day! See, Santorini was the place where my wife and I got married and spent our honeymoon. Santorini is actually a honeymoon island. Many people all over the world choose this place to spend the happiest days of their lives. Since I always wanted to get married at a Greek island, I just had to pick Santorini. OK, instead of scattering general information about Santorini here and there, let me just say everything at once. So, Santorini was originally named Strongyli because of its shape (Strongyli means round in Greek). 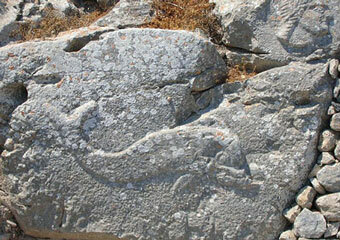 It is also known as Thera, named so by the Dorians when they settled there in the 8th century BC. As for the name Santorini, it originates from the Latin Santa Irini and it has been the name of the island since the 11th century. 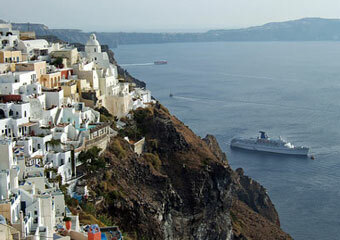 Santorini is the southernmost island of the Cyclades and one of the most popular islands in Greece. Actually, it is regarded by many as the most spectacular of the Greek Islands. It is also the honeymoon capital of Greece. If you search for accommodation in Santorini I recommend you to visit Santorini Hotel Online Bookings. There, you can make your reservations directly to the hotels and find rooms in low prices and useful guest reviews. 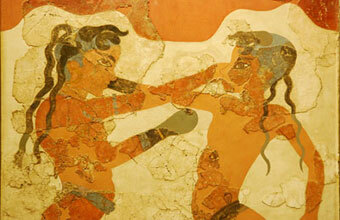 First of all, you ought to pay the museums of Santorini a visit. The Archaeological Museum, for example, has many beautiful exhibits from the Geometric and Roman times, as well as findings from Akrotiri and the ancient city of Mesa Vouno. There is also the museum of Prehistoric Thera and the New Archaeological Museum that contains the colorful Fira frescoes that were originally thought to be from the mythical city of Atlantis. 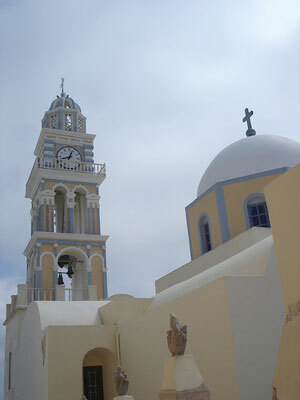 The Catholic Quarter is one of the most beautiful sections in Fira, the capital of Santorini. At its centre, you will find the Ghisi house, an impressive house maintained by the Catholic Church. But the quarter you should not miss is the Old Quarter of Kato Fira, a silent maze of little streets bathed in light. Two domes rear up from this terraced cascade of houses: Agios Ioannis church and the Agios Minas. One of the places my wife and I enjoyed visiting was Profitis Ilias Monastery. No, seriously; My wife used to hate visiting all those places, but that time she seemed to have a really good time looking at the exhibits, the tools and the complete workshops of the various crafts that were practiced there by monks since its founding. Okay, there is a slight chance she liked it because it was our honeymoon and she did not want to disappoint me. But the monastery is extraordinary. Note that the remaining monk is not obliged to keep regular hours for tourists, so try to ascertain the monastery is open before setting out for your climb. Finally, the village of Oia that was devastated by the 1956 earthquake is a delightful, quiet place with dramatic sunsets and narrow passageways that get crowded in the evenings. Although it is quiet, it has its fair share of trendy boutiques and expensive jewellery shops. Well, I believe I should start with Ancient Thera. 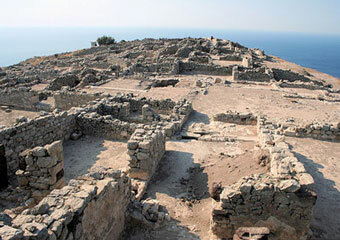 Ancient Thera was excavated by the German archaeologist Hiller von Gortringen in the 1860s. Most of the ruins that are still visible date from the Ptolemies, but there are also Hellenistic and Roman remains. Some of the things you will see are remains of private houses (some with mosaics), the agora (market), a theatre, an early Christian basilica and a 3rd century BC sanctuary. On the Terrace of Celebrations, you will find the graffiti that dates back as far as 800 BC. 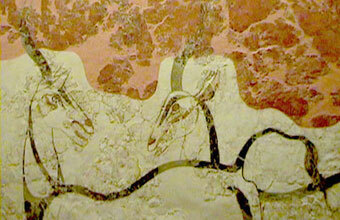 Akrotiri is one of the most inspiring sites in the Cyclades and the story of its discovery has a sense of tragedy. After an eruption in 1866, French archae-ologists discovered Minoan pots at Akrotiri. But it was professor Spyridon Marinatos who unearthed the complete city in 1967. Surprisingly, it was wonderfully preserved after some 3500 years of burial under tons of volcanic ash. Now, you want to know the tragic part of the story? Marinatos was killed in a fall on the site in 1974 and buried besides his life's work. Finally, do not miss the Guizi Palace, a patrician villa that was completed in 1700. Its beautiful windows and doors are embellished with dark stone. After the tremor of 1956, it was restored and converted into a Cultural Centre to preserve manuscripts, old publications, costumes and traditional objects from the 16th and 19th centuries. Santorini's beaches have one thing that can make them either unique or (usually) not particularly good in people's minds: instead of the usual golden sand that the beaches of the Greek Islands have, they have black volcanic sand. There are a couple of beaches that my friends and I did enjoy: the White beach, for example, is small but quite beautiful. Its only accessible by caique from the shore to the right of Akrotiri. My advice? Take a mask to explore the underwater scenery. Perissa is the most known and popular beach in Santorini. It has restaurants, hotels, camping facilities and water sports among others in its 8km of black sand. Perivolos is a continuation of Perissa and that is where all the beach bars, cafes and tavernas are. Parties are organized on a daily basis from noon and the bars are filled with people. 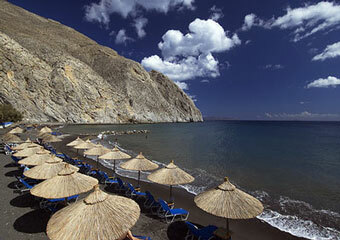 Vlyhada, then, is an impressive beach with typical Santorini rock formations protruding from the sea. Monolithos is on the east side of the island, a pretty good beach with facilities for water sports. Finally, the Red Beach is the one we enjoyed the most, one of the finest beaches in Santorini, composed of black and red volcanic rocks. 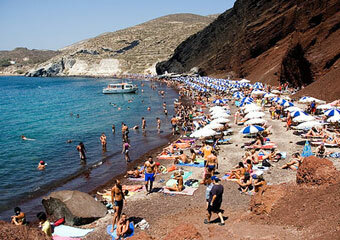 To learn more about the rest of the beaches of the island visit my page Santorini Beaches. If you want something more traditional, visit George's ouzeri in Fira which will make it hard for you to lift your heads from your dishes. Visit my page on George's Ouzeri to find out more about it. Moving on, Skala is in the main street in Oia. It has the finest terrace in town and it has delicious dishes, without being too pricy (eating there will cost you around 15 euros per person). Aktaion in Fira is another excellent option with a courtyard which serves some of the best dishes you will find in Santorini, at a very good price. Archipelagoson Ypapanti Street is a popular restaurant with classic Mediterranean cuisine. Definitely order fish, any fish you want - all the fish dishes are delicious. 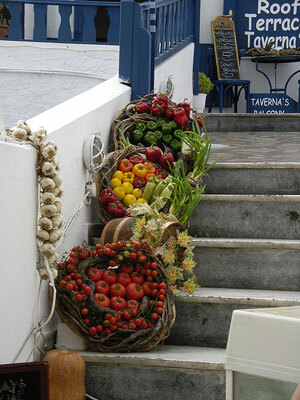 At the beaches of Santorini there are also many tavernas and restaurants with fresh fish, serving local dishes. For more restaurants take a look at my page Santorini Restaurants. One would expect that an island attracting so many honeymooners and couples would not have an interesting nightlife. 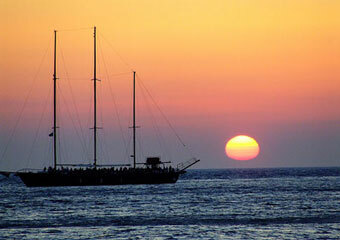 Santorini is not only famous for its sunset, but also for what is happening after that! At Fira you will find most of the bars and clubs, like Tropical on Marinatou Street. Tropical is a bar with a winning mix of rock, soul and sometimes jazz; its crowd is international and the view from the balcony is just incomparable. Other places? Koo Club fills its spacey levels with mainstream Greek hits, plus hip hop and drum base. Two Brothers is a hot spot for rock, Kira Thera for jazz and blues, Mamounia Club for Greek music. The all time classic Enigma Club and the relatively new arrival of Taj Mahal are venues where the party never ends! Now Francos Bar is famed throughout the world. Opera music in the back-ground, a beautiful sunset view, a comfortable chaise longue turned to face the caldera. Believe me when I say it is a must. You will relax more than you could ever think is possible. There are several flights daily with Olympic Airways and Aegean Airlines from Athens. The duration of the flight is approximately 25 minutes. There are also connecting flights to Mykonos, Rhodes and Heraklio. The airport of Santorini is 8km from Thera, but there is a bus service to get there. By boat, the journey lasts about 9 hours from the port of Piraeus, from where boats leave daily. During the summer there are also connections from Thessaloniki. There are also speed connections leaving from the port of Rafina almost all year round. Especially during the summer months Santorini is essentially linked to most of the islands in the Aegean via ferry boat and high speed ferries, either directly or through lines from Piraeus and Thessaloniki. 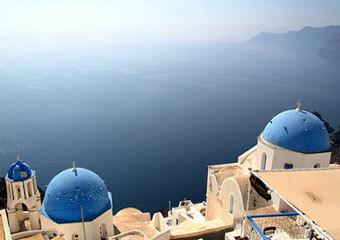 Flights to Santorini from the Athens Airport "Eleftherios Venizelos"